A “severe” blaze is being tackled by firefighters at a mental health centre, fire bosses say. Emergency crews were called at about 21:15 GMT to the George Bryan Centre in Tamworth, Staffordshire. There have been no reports of any casualties, Staffordshire Police have confirmed. 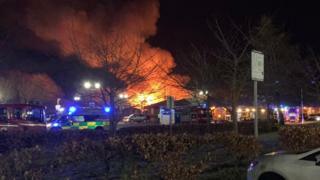 “All occupants and staff have been evacuated from the centre and are being transferred to other local medical centres,” the force said.